"I spoke to Roberto Martinez in late January and we had a conversation"
Radio City DJ Simon Ross put the questions to both Joe and Big Nev. The Irish Toffees hosted an evening in Dublin with two Everton Legends as the guests of honour, Neville Southall & Joe Royle. Before the event took place I had the opportunity to interview them both. 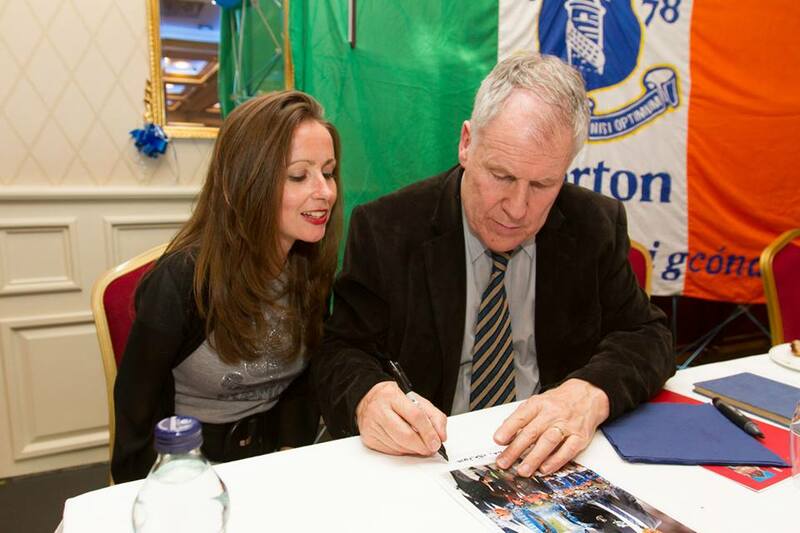 First up in the review is my interview with Joe Royle. I knew all about his achievements as a player but I wanted to talk to him about a very special time, if you are in the mid 30’s age bracket like me, in Everton’s history. The early 90’s were a bad time for the club and it says much about the period that the first thing I can remember really celebrating was the miracle last day relegation escape about Wimbledon in 1994. Despite noises from the club that we would never go as close to relegation again, the following season under Mike Walker started even worse. A paltry total of 8 points from the opening 14 games left relegation feeling like an inevitability even in early November but the sacking of Walker and subsequent appointment of Royle led to one of the remarkable seasons in the club’s history. Of course the appointment of such a playing legend was bound to lift the fans but how did Royle manage to lift the morale of a squad who had become so accustomed to losing? “My first game in charge was a reserve game at Anfield. There were three players playing in that game that I told immediately after that they were going to be in the first team. They were Joe Parkinson, John Ebbrell and Andy Hinchcliffe. I couldn’t understand why there were playing in the reserves, I knew they were strong players, I knew what they would give us and I knew we had to play a certain way, shall we say, an aggressive style, an all action style, not totally dissimilar to how Chelsea play now, if we were to get away from the bottom,” he said. It led to the teambeing nicknamed the “dogs of war” but Royle was only ever interested in finding the best way of playing for the group of players he had available to him. Some players who became sterling operators under Royle remain firm favourites at the club to this day, none more so than Duncan Ferguson. “People say that Duncan didn’t fulfil his potential but you have to take Duncan for what he was and not what he might have been. There are very few players that you could say did fulfil their potential, it was said about me that I never fulfilled my potential. Having the ability to fulfil your potential is a talent in itself, some people can’t do it but you’ve got to say that what Duncan did and with a goal record of something like one in three for Everton was pretty good. He gave the Everton fans at the time something more than all the talent in the world could do. He gave them a reason to believe. He a talisman, the fans loved him. He scored his first goal for the club in a derby game and the legend was born,” said Royle. A lot of Ferguson’s strikes owed to the accuracy of Andy Hinchcliffe’s prodigious left foot. The left back was somebody that Royle turned from an Everton reserve to England international in under two years. 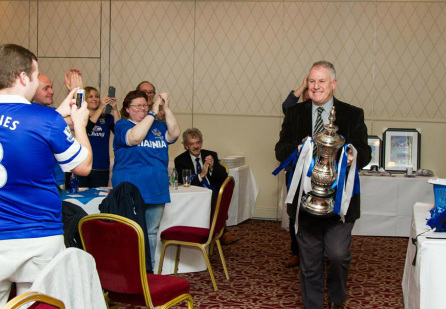 Joe Royle enters the room carrying the FA Cup he won 19 years previously. Joe stayed into the early hours signing autographs and making sure every fan got to meet him personally. “Andy Hinchcliffe went from zero to hero in the space of 12 months . He played in that reserve game at Anfield and I said to him after the game, “Why aren’t you playing for England?”. He was at a low ebb at the time because he couldn’t get into the Everton side and he told me, “I can’t play for England if I can’t get into the first team.” I told him the Everton side of things was sorted and asked him again “Why aren’t you playing for England?”. He rose and got better and better and had a wonderful, wonderful left foot. People talk about Baines’ delivery, well Andy Hinchcliffe was pretty special as well,” said Royle. Back to that special season, I would have thought that the confidence gained from a cup run ending at Wembley would have given the squad confidence in their relegation battle but the manager felt different. I can remember literally chewing my finger nails to the bone during the second half as the likes of Neville Southall, David Unsworth and Joe Parkinson heroically threw their bodies on the line to repel the stream of Manchester Utd attacks but on the sideline, the manager was more relaxed. “And we did it the hard way by the way. We beat five Premier League side in the six games to win it and the only time we were in serious trouble was against Bristol City who weren’t Premier League. We beat Manchester Utd in the final but also beat Tottenham in the semi, we beat Newcastle, we Norwich, we beat Derby, they were all Premier League teams. It wasn’t an easy run. There are teams who have won the cup without playing any Premier League teams but had to beat five to win it. The next season saw Everton finish a very creditable sixth and they were in that position at Christmas of the 96-97 season before things started to unravel for Royle’s Everton, mainly due to a whole host of serious injuries. The end of his reign in charge certainly never diminished the achievements of his first season and he rightfully is remembered as one of the club’s best to this day. And there is now the chance that he could come back to the club with Roberto Martinez looking to tap into his vast knowledge. (It is great news to hear Joe Royle has indeed re-joined Everton Football Club today, we are sure it will be fantastic move for all involved). Joe was interviewed by Journalist Ger McNally. Many thanks to Ger for sharing this with us. Some of the exclusive merchandise on show at the event.